Enjoy a quick-fix Salsa-Cheddar Chicken meal that's picky-eater-proof. 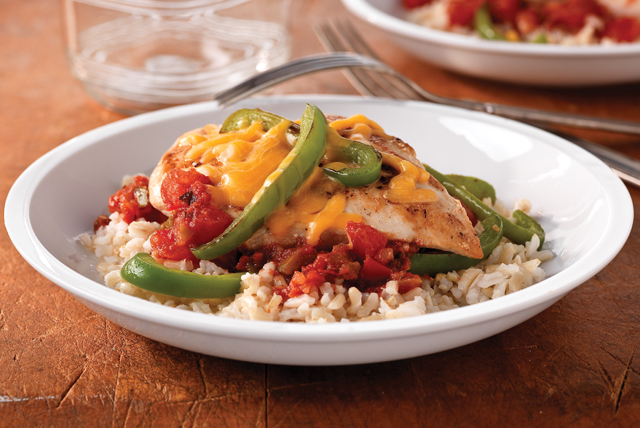 Add a little kick with salsa and zesty dressing in Salsa-Cheddar Chicken. Heat dressing in large skillet on medium heat. Add chicken; cover. Cook 4 to 5 min. on each side or until lightly browned on both sides. Remove chicken from skillet; cover to keep warm. Add peppers to skillet; cook 5 min., stirring frequently. Stir in tomatoes and salsa. Return chicken to skillet; cover. Simmer on medium-low heat 10 min. or until done (165ºF). Add 1 rinsed 15.5-oz. can black beans or 1 drained 15-oz. can corn to cooked peppers in skillet along with the tomatoes and salsa. Prepare recipe as directed, dividing all ingredients in half. Makes 2 servings. Substitute whole wheat pasta for the rice.